Lao food has an incredibly fresh taste largely influenced by the wonderful use of herbs that transform simple ingredients into delicious meals. The beef Laap dish served in most restaurants these days is made a little more palatable for westerners with the meat now being cooked rather than its traditional raw version. Herbs gave the dish great flavour, while the crunch of bean sprouts made for added texture. A traditional clear soup of meat, herbs and vegetables, Orlam makes for a nice light meal, giving you the impression that eating it really is good for you. To broaden your food experience beyond local Luang Prabang fare head for Le Patio Cafe at the Traditional Arts & Ethnology Centre, which serves a range of minority dishes from various nearby provinces. The food is very good, with the menu offering the ability to taste a nice mix rather than being stuck with just one dish. Set in a lovely old building, insight is also given into the people and culture where the dish hails from. Oh and if that’s not enough, there’s also a delicious selection of French pastries to finish with. Tamarind restaurant has a great reputation for its food, and based on my experience it’s very well deserved. Using ultra fresh ingredients it serves up a fusion of traditional local dishes with a few modern touches. The Mok Pa (steamed fish with herbs) was simply divine – tender, fleshy fillet of fish with dill and basil, wrapped in a banana leaf and steamed to perfection. The melt in your mouth fish morsels were accompanied by plump, glossy grains of sticky rice, which also proved excellent for soaking up the juice. 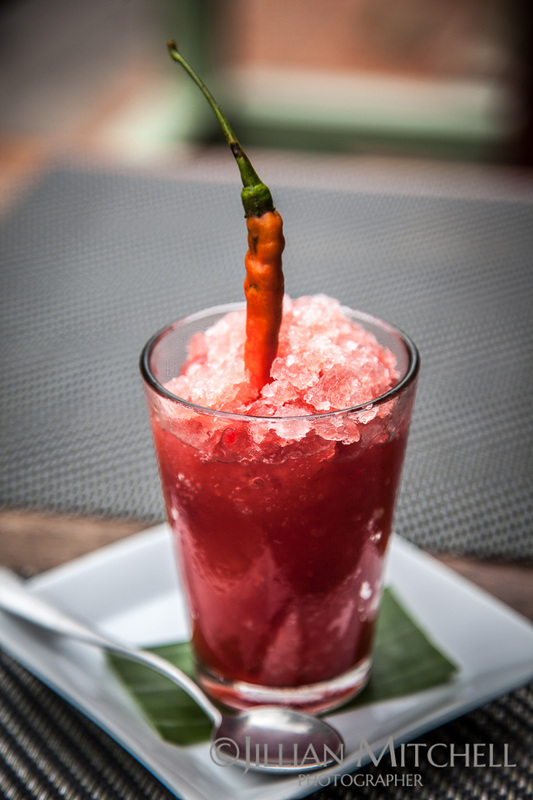 So cool and refreshing in the blistering heat, the watermelon and chilli granita was a tantalising icy mix of sweet and spice – a drink I swore I’d be looking to replicate at home. Meals were definitely a highlight for me in Luang Prabang, with the taste and style both in complete harmony with the heat and humidity of the environment. A damp coolness lingers in the air as a sea of vibrant saffron seemingly floats along a deserted narrow road in the faint early morning light. Framed by lush greenery and traditional wooden architecture a smattering of locals patiently sit with their bamboo baskets filled with sticky rice as they wait to give alms. Witnessing this serene, special event also referred to as Tak-Bat was a highlight of my stay, however not every scene plays out with such reverence. I couldn’t even bring myself to raise my camera at the alms giving that took place just outside my hotel in Luang Prabang. There were no other onlookers; I imagine this same event would have been repeated thousands of times in exactly the same manner. Unfortunately, this was not the case in the centre of the Luang Prabang. Where I can only describe the Tak-Bat here as a circus which features these ridiculous camera-toting tourists jumping in, out and around the monks who were silently attempting to carry out this Buddhist tradition. Despite the rules of conduct being well publicised around town, the behaviour of many left me incredibly conflicted about taking my own photos and the impact of tourism on this age-old ritual. I was a little horrified to find it has almost become a “tourism experience” with visitors being given the opportunity to take part in the tradition and give alms. The desire to give can only be commended but I question taking part in sacred religious rituals where there is no real association. In some ways I think it makes a mockery of the situation. Poor quality food is a further complication where some monks have become sick from rice given by some unsuspecting tourists, as this is purely a money making opportunity for some. I moved away from the main street and to my relief I found a much quieter place where I could sit at a distance and take photos. I am very thankful for my zoom lens! So frequently it happens that visiting a place which you had enjoyed many years before, you are disappointed when returning to find the masses have discovered your once much less trodden haven, sapping its former wonderful atmosphere and cultural authenticity. Before returning to Luang Prabang recently I feared the worst after having read many comments online about how much things have changed. It’s about 10 years or so since my last visit, and I must say, that sure things are different but on the whole I still had an amazing time. The old part of town remains a sleepy slice of cultural heritage with pretty monasteries sprinkled amongst a fabulous mix of restored French colonial and traditional Lao architecture. One of the most profound visible differences I found were the growing number of upscale boutique resorts occupying beautifully renovated old buildings, with classic luxury vehicles standing ready to ferry around well-heeled guests. I’ve never been one to visit every tourist attraction out there, preferring to sit and enjoy some local food whilst soaking up the ambiance of a place – Luang Prabang is simply perfect for this. I wandered aimlessly through the temples just enjoying their spectacular beauty enveloped by the light scent of lingering frangipani. Kids hunt for the healthiest of snacks in the quiet streets by using large bamboo poles to jab away at fruit hanging high in the treetops as monks drift by, their dazzling saffron robes adding vibrancy to the lush green surrounds. Of course, these days there are many new activities for visitors to get involved in, but the majority of these seem to be quite culturally complimentary with a definite ecological slant – the cooking school and weaving centre are two that immediately spring to mind. While relaxing with a cool drink on the banks of the mighty Mekong or Nam Khan river, as the sun dips lazily towards the horizon, is the perfect way to end the day. Possibly one of the most influential factors on how much you enjoy your stay is your choice of accommodation – I enjoyed being in a more local part of town, which was still just a short bike ride from all the action. Although Luang Prabang has definitely grown, and is a little more polished than it was 10 years ago, it remains one of the most charming outposts in Asia.